Not too long ago, the success of alternative energy was entirely dependent on staggeringly steep crude oil prices. That and tax credits made alternative energy competitive to fossil fuels. The higher crude prices went, the better alternative energy looked by comparison. This dynamic played out perfectly on Wall Street, where solar stocks would track crude oil prices almost in lock step. In early 2016, oil prices collapsed. It didn’t take long for solar stocks to follow suit. 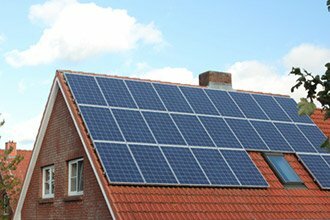 For example, First Solar Inc. (NASDAQ: FSLR) traded for $70 per share in January of 2016. By the end of the year, First Solar was priced at $30 per share. As crude recovered from those lows and peaked in the fall of 2018, shares of First Solar fought back to that $70 level. In Q4 2018, amidst a rate hike cycle at the Federal Reserve and a strong dollar, crude prices fell below $50. Once again, down went First Solar. By the end of the year, the stock had fallen approximately 40%. But thankfully, we’re finally in a place where solar stocks aren’t completely dependent on the price of oil. The solar industry has matured in a way where the price of oil simply doesn’t matter going forward. In fact, as solar becomes more prevalent, demand for crude will conceivably fall. Of course, that would pressure oil prices. 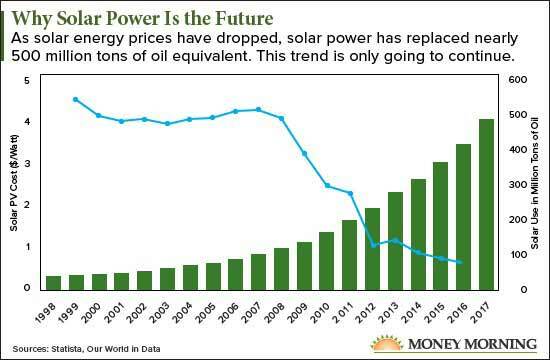 The cost of producing solar energy has dropped dramatically too. As volumes of solar energy increase, the pressure on crude will be immense. It may not matter much, but the U.S. Federal Reserve is also providing a huge tailwind to solar as well. A dovish central bank takes the air out of the dollar. It also increases asset prices like oil. The same cannot be said of solar. In fact, if oil prices continue to move higher from here, the price of solar will further decline as demand for alternative energy increases. And what happens to alternative energy stocks in that environment? The Money Morning Stock VQScore™ system is well aware of this.